While U.S. Army Sergeant Jason Van Loo was busy serving his country in Afghanistan as a vital member of the 32nd Transportation Company, 43rd Sustainment Brigade — a group also known as the “Rough Riders” — his best friend, 10-year-old Labrador Retriever Blu, was never far from his mind. But back in April, Sgt. Van Loo got a message from his wife, Kari, which read like a punch to the gut. Blu, Sgt. Van Loo’s canine companion, had been diagnosed with aggressive cancer and likely only had two months to live. Sgt. Van Loo and Kari were heartbroken. With Sgt. Van Loo not slated to return home until August, it seemed more than likely that he wouldn’t get the chance to say goodbye to the dog who’d been there for him through thick and thin. But Kari wasn’t ready to give up on Blu. She knew her husband had been through so much during his tour of duty, and she wanted to do whatever possible to ensure he’d get to see his boy Blu again. Finding the best treatment for Blu’s cancer became top priority, but she knew doing so could put a serious financial strain on her family, which also includes two autistic children and two little girls the couple is helping to raise after their parents’ deaths. With little money to put towards Blu’s cancer treatments, Kari and her kids started holding garage sales around Fort Carson in Colorado, hoping to raise enough funds to get Blu the help he needed. But as Blu’s story spread, donations started pouring in. Friends and strangers alike started to contribute to the “Team Blu Van Loo” movement and finally, the Van Loo family was able to get him in to see the veterinary team at Colorado State University’s Flint Animal Cancer Center. Ten rounds of chemotherapy, a leg amputation, and an additional surgery later, Blu was there to greet Sgt. Van Loo when the American hero returned home in August. Sgt. Van Loo tells Colorado State University (CSU) his tearful reunion with Blu is a moment he will never, ever forget. 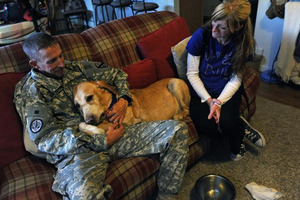 Though Blu has only three legs now, he’s still the same dog, says Sgt. Van Loo. Right alongside Sgt. Van Loo’s family and his beloved dog was a whole group of friends the soldier had yet to meet — the CSU veterinary team who’d been treating Blu’s cancer. Kari says the members of the veterinary team have been some of Blu’s biggest supporters. A CT scan revealed that Blu’s cancer has spread. Sadly, he is entering the last weeks of his life. As for Sgt. Van Loo, he couldn’t be happier to have the chance to spend time with his dog, even if that time is so limited. Blu is helping him adjust to life back home, he explains. “He’s a godsend,” Van Loo adds.